A little known Copenhagen cycling trick: combining a dapper flat cap [called a sixpence in Danish]and blue balloons will increase your aerodynamics on the bike lanes. If those are helium ballons then the vehicle will be lighter and thus reduce rolling friction as well. and yes, anneke... blue is paramount. That dude rocks! Love the balloons! 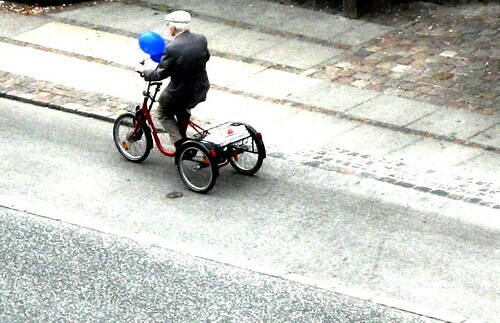 We just watched Le Balon Rouge the other day, and this reminded me of that - not to mention it makes me very happy to see an older man with balloons on his bike. Pretty much the only people who don't look at me strangely in Portland for riding a bike in a suit are older people, they always smile at me and I love it. I want that trike! You can tie all the balloons you want onto it! Since this blog is largely about woman, I'd also like to point out the invention of someone I know who used three GREEN helium baloons to carry her long ponnytail. melancholic... when do we see photos?! !